VATICAN CITY, Italy – The prefect of the Congregation for the Doctrine of the Faith, Cardinal William Joseph Levada, has given a lecture before the international symposium “Towards Healing and Renewal” which is held in Rome’s Gregorian University from February 6 to 9. The said event gathers bishops and religious superiors from all over the globe which aims to re – launch the Church’s commitment to safeguard minors as well as people in need from abuse. 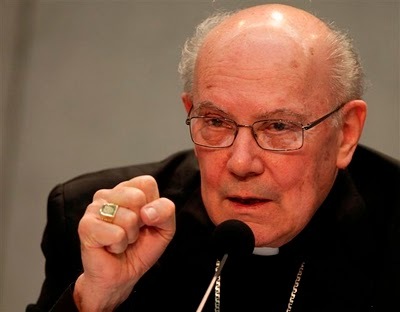 Cardinal Levada mentioned how Blessed John Paul II’s Motu Proprio “Sacramentorum sanctitatis tutela” explained as well as updated the list of canonical crimes, even including the sexual abuse of minors by clerics being one of the most serious crimes, or “graviora delicta”. VATICAN CITY, Italy – In an international symposium on clerical abuse, an Irish woman shared that Pope Benedict is a model of how to listen to victims. She had been a victim of abuse by a priest during her youth. “Listening to victims is one of the most important things, and it was something that was maybe not done enough, and the Pope is giving an example as to how it should be done,” Marie Collins mentioned during the symposium. Lord Cardinals, venerable brothers in the episcopate and priesthood, dear brothers and sisters! It is always a joy for me to meet with you on the occasion of your plenary session and to express my appreciation for the service that you undertake for the Church and especially for the Successor of Peter in his office of confirming the brethren in faith (cf. Luke 22:32). VATICAN CITY, Italy – Pope Benedict XVI received a delegation of children from Italian Catholic Action this morning in the Vatican. The pope also exchanged greetings with them and moved on with his message. The Holy Father thanked the visiting group and then went on to express his message on a theme they have been studying on this past year: the invitation made to Bartimaeus in the Bible, “Arise, He is calling”.